Trail and shockwave: 1, 2, 3, 4, 5, 6. Dashcams: 1, 2, 3, 4, 5, 6, 7, 8, 9. Many windows broken and there are reports of a collapsed factory. My first thought was DA14, but then came to realization that's impossible. Also, if DA14 hit it would have done A LOT more damage than that. They're too far apart and too small to be gravitationally bound, of course, but it's not entirely unthinkable that they could share a fairly recent origin. That should be easy to rule out, however, if they don't share orbits. Was today's blast even on the right side of the earth? I hope someday I can see something like that in person. As long as no one dies from it and the damage isn't too bad I think that would be pretty incredible. Was today's blast even on the right side of the earth? I can't find info about thet, maybe some Russian speakers can? If it was, that may be really interesting as others may follow. According to one story on this, 2012 DA14 is approaching earth from the south but today's blast was on the northern hemisphere. I heard it went south-east over north, so if that cloud was aimed north or north-west, it could be. That is if what I heard is correct. It's seen that meteorite comes from nothern hemisphere, so it is not related with 2012da14. The meteor trail was also photographed from space. if DA14 hit it would have done A LOT more damage than that. What?! 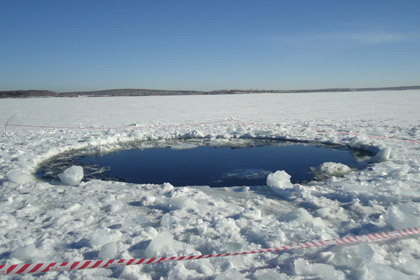 Do you think that would remain in history like Tunguska event?